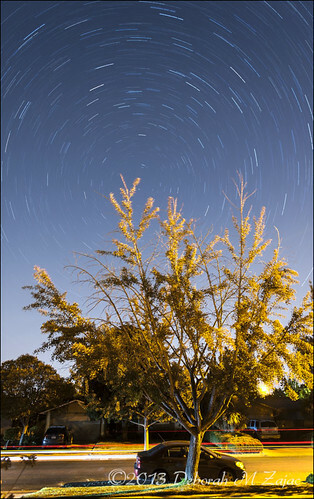 Star Trails from Home, originally uploaded by CircadianReflections Photography. I noticed that Polaris almost lined up with my front door this evening so, bored and Jonesing for some night photography I set up to shoot star trails. A couple of cars passed by while I was exposing so I captured head and tail lights too. My Ginko Tree I see needs some pruning, and some TLC from the Gedde’s: My favorite tree service.